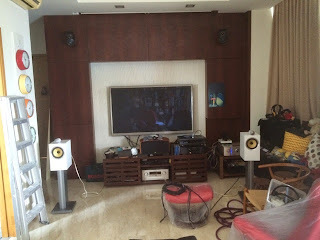 I have been playing with a new pair of speakers recently and with some of the furniture out of the way, my acoustic professional friend Nic and I could play more freely with the position of the speakers. Instead of being forced to plaster them close to the full, we could then move them further out into the room, widen the space between, and compare. Indeed, there was an incredible increase in soundstage, depth, and imaging. Drums got tighter, the voices clearer, whilst the space between instruments and definition all benefitted. All this without spending a cent on any equipment upgrades or even acoustic treatment. So before we consider buying new gear, we may want to try moving our speakers around, vary the toe-in, and also the listening position. Just sharing something I have already begun using as more speakers come into play. As we have more than 50 cables / connectors coming out of the modern AV ampifier, one should get proper labels. For a cheap solution, you can simply use masking tape or even black tap and write on it, but these tend to get icky with time. As we keep increasing the number of speaker cables, keeping track of them will become even more important to avoid accidents. Denzel Washington is one of the greatest character actors ever, and yet, I won't count this as one of his best efforts. This movie, a kind of re-make of a TV series, has elements of Punisher, Taken, Get Carter, and other vigilante hero type movies that features a highly trained, yet reluctant hero who possesses certain skills that allows him to hurt others badly. I guess that means the plot is hardly original, yet Denzel is the main reason to watch this. He has done this before, ala Man On Fire, in which he was also a highly trained person that can cause serious hurt to his enemies. There he was also a protector, and goes to all ends of the earth to find and destroy those who will harm whoever he loves.